Directors: Don Hardy jr, Dana Nachman. This wonderful observational documentary follows five cute puppies on their journey to become seeing eye dogs for the nonprofit organization Guide Dogs For The Blind. Every year in America some 8000 dogs enter into a rigorous training program to become seeing eye dogs, but less than 30% succeed and make the cut. The puppies are fostered out to volunteers for the first 12 months to gain structure, routine and get used to social structures. Then they are returned to the main training facility for more rigorous testing as they are trained to walk the streets and ignore distractions, travel on trains and planes, and to avoid traffic and be aware of potential dangers. Some of the puppies prove too adventurous or curious or unable to concentrate on their tasks and are cut from the program – or “career changed” is the term used – and often become domestic pets or breeders or are put to other uses. The nature of the training routines becomes repetitive, but the stakes are raised as they are put through their paces in the final stages of training. 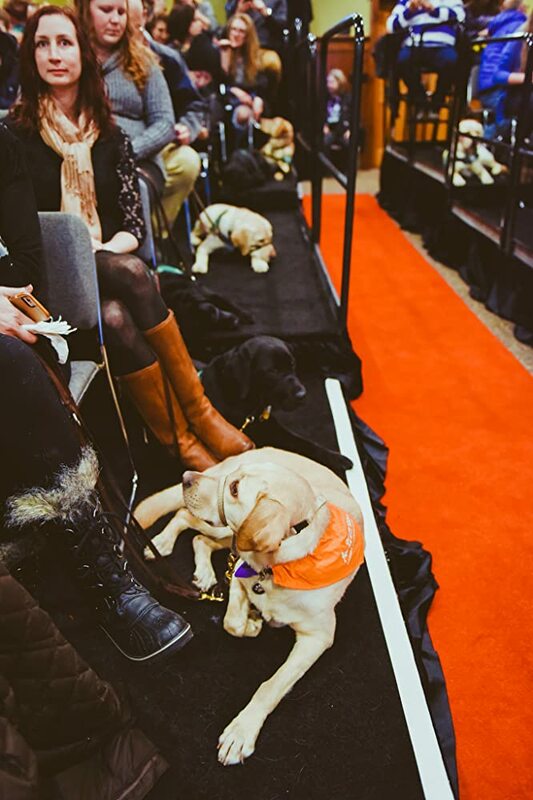 We also meet a couple of potential recipients of a seeing eye dog and get an idea of the emotional connection that can develop between dog and its blind human partner. We see how a dog can make a difference to their lives and sense of independence. One person tells how his dog literally saved his life by leading him down 70 flights of stairs in the World Trade Centre on 9/11. Veteran documentary filmmakers Dana Nachman (Batkid Begins, etc) and editor/cinematographer and co-director Don Hardy jr (Love Hate Love, etc) spent two years working on this project. They follow five puppies from the time they are born through the 18 months of intense preparation and training they undergo. The right dogs need to be intelligent, patient, obedient and hard working. The dogs are named Primrose, Patriot, Poppet, Potomac and Phil. Each of them has their own distinctive personality which emerges as the film progresses. Audiences will fall for these cute canines, and will have a favourite puppy from amongst the litter that they hope will pass the testing process. Pick Of The Litter is not only an informative and entertaining documentary but it is also a feel good film ideal for families. A must for dog lovers!